This database is for information only and should not be used otherwise. Users of this database should be aware that it does not contain all certified combinations of takeoff and landing mass limits. The interpolation between weights to determine the noise level at an intermediate weight is not an approved ICAO process. The NoisedB project has been realized under the aegis of the International Civil Aviation Organization (ICAO). It has been developed to satisfy a need expressed by the international civil aviation organizations  to create a noise level certification database which would be comprehensive, accessible and guaranteed by certification authorities. The goal of this database is to provide certification noise levels for each aircraft type. The NoisedB application is intended as a general source of information for the public. NoisedB provides certified noise levels of civil transport aircraft types certificated mainly under ICAO Annex 16, Chapter 3 and Chapter 4 Standards (and under FAR Part 36, Stage 3 and Stage 4). National variants (noise levels applied in a particular country) are also indicated. A set of parameters which define the airframe and engines are described for each airplane type and model, with all notified modifications. Data can be obtained for an individual aircraft type or for several aircraft types in table form. NOTE: This database provides information about certified noise levels of aircraft types, however the definitive source of information for types is the official Noise data established in the process of Type Certification and for individual aircraft the Noise documentation granted or rendered valid by the State of Registry. a) Data submission is voluntary. b) Manufacturers are to submit data to the aircraft’s State of Design for review and approval. The State of Design is to submit the approved data to French DGAC in its role as maintainer of the database. c) The submitted data could be for new models, changes in type design, and/or Supplemental Type Certificates. d) States of Design follow individual processes (including frequency of data submission) for providing updates to NoisedB considering limitation on their resources to devote to this activity. e) ICAO Committee on Aviation Environmental Protection (CAEP) Working Group 1 (WG1) will review updated database information for consistency in formatting (e.g., consistency in airplane and engine model designation format) at each WG1 meeting. Validation that the correct airplane noise levels have been included in the database will be the responsibility of the State of Design submitting the noise levels and the French DGAC in its role as maintainer of the database. 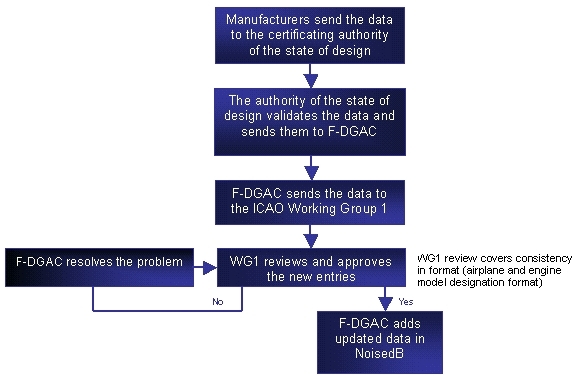 Publication of the database revisions on the ICAO website (linked to DGAC website) will occur after approval by WG1.